In the second of this week’s WOVEMBER posts featuring Kate Graham and her farm at Shankend, Louise finds out more about the sponsorship scheme Kate runs. Earlier this year I had read an article about Ralph Lauren buying yarn from a farm in Oregon to clad the entire USA team for the Winter Olympics in Sochi. Loving the idea of a single estate collection I had mused on social media that it would be wonderful to create something which followed the journey from sheep for finished knitted item. 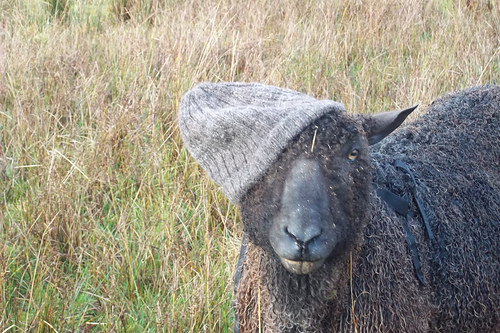 I was quickly pointed in the direction of a group on Ravelry that had recently started a sheep sponsorship scheme. Earlier this week we met Kate Graham, who farms at Shankend in the Scottish Borders. When Kate created the sponsorship thread in her Ravelry group, she put up pictures of her sheep (like the most prized stash page ever!) and asked people to get in touch if they wanted to sponsor the sheep for a year – she was bowled over by the response. In return for their sponsorship (£15-35 per year, depending on breed) the sheep fosterer would be able to name the sheep, receive updates throughout the year, arrange visit to see their animal and receive it’s fleece when shearing time comes around. After reading about the scheme I was first struck by the question, why haven’t we been doing this for years and years?! How amazing to gain real insight into the wool journey. There is more and more interest in provenance of wool these days and sponsoring adds such a depth of insight. I spoke to Kate about her experience of the first year of the scheme so far. What inspired you to start a sponsorship scheme like this, Kate? Up until November 2012 I was also working on a hill farm as well as running Shankend. When I lost the hill farm job, Shankend was my primary source of income. To help make ends meet and pay for the upkeep of the livestock, selling premium products and offering premium service,like the sheep sponsorship scheme, would be very helpful. In October 2013 the idea of sheep adoption/sponsorship became a topic of discussion on the Woolsack forum on Ravelry. The idea didn’t seem to be something that was current within the UK, or at least not to the extent where you get the fleece from the sheep you sponsor. Nothing much came from the chats online, and in February 2014 I decided that I have nothing to lose in giving it a go. I offered up a few sheep for sponsorship thinking that I would be lucky if I get a couple of them sponsored and then perhaps the following year there would be more takers, but the idea seemed to inspire lots of people, and sheep were being sponsored as soon as the photo was up on Ravelry and before I had even put information up about the sheep! You have over 200 sheep of different breeds – how did you manage to choose the sheep you wanted to put up for the scheme? The sheep breeds that I currently run are Coloured Ryelands, Scottish Blackfaces, Herdwicks, Hebrideans, Shetlands, South Country Cheviots, Black Wensleydales and a selection of crosses. The sheep that were put up for sponsorship covered most of my breeds, (with the exception of the Coloured Ryelands, as their fleeces had already been pre-ordered). I had ewe hoggs, ewes of all ages, and tups available giving a diverse range of choices for those interested in the scheme. The sheep selected for sponsorship were chosen for a number of reasons – the older ewes, who had been shorn by me before, were selected on the quality of last years wool; the ewe hoggs were selected on expected wool quality, wool colouration, and some of them were selected purely on character, for example last years pet lambs. By the start of August this year 53 sheep had been sponsored. 51 more that I had expected!!! I was absolutely thrilled by the uptake! So, once the sheep is chosen what are the next steps in the process? E.g. costs and membership benefits. The cost of sponsorship per year varies on the age and breed of the sheep. It also depends on the location of the sponsor – I have to charge extra for those outwith the UK to cover the higher cost of postage abroad. Prices start at £15 for the year, and the most expensive is £35. Sponsorship of the hoggs is the most expensive; as the fleece that the hogg produces is the best and the heaviest that she will produce in her lifetime. For the sponsorship fee, the sponsor will receive four e-mail newsletters throughout the year at times of interest during the shepherd’s calendar. The sponsor will also receive the fleece from their sponsored sheep along with a photo. The sponsor is more than welcome to come to Shankend and visit their sheep, and meet all the other livestock. What does the sponsorship fee go towards once the sheep has been chosen? The sponsorship money covers the cost of shipping the fleece, (including the purchase of a box from a local supplier), and covers the cost of shearing. I do shear the sheep myself, but there are costs involve in shearing, for example the maintenance of the shearing machine, sharpening of combs and cutters and diesel for the generator to run the machine. The rest of the money goes into the farm to help pay for feed, medicine, rent etc. Farming has a lot of inputs and very few outputs, so farmers – especially smallholders like myself – need to diversify and sheep sponsorship is an example of diversification. You’ve been bowled over by the interest and responses to the scheme, what has been the most rewarding aspects for you? It is very rewarding to take people on this journey following the shepherd’s year. It is a privilege to be able to meet all these enthusiastic people and show them the work that goes into producing the fleeces. A sheep is such a valuable commodity but she takes a lot of looking after to produce good wool and good meat, and giving people on insight into the day to day life on a livestock farm has many benefits including education, breed awareness, (especially in the case of the rare breeds), and an understanding of the vocation of farming and how it is not a Monday to Friday 9 to 5 job, it is a lot of hard graft but with a lot of rewards at the end of it. The sponsorship scheme will offer knitters and spinners, the opportunity to follow the journey of not only the wool they receive, but also the sheep that has produced it. It allows the sponsor to see how that sheep has been reared and it offers a more personal connection to the sheep where their wool has come from. We know that knitter’s can be very discerning about the wool they knit with and this scheme has truly bred a lot more interest and appreciation in wool and also the process. 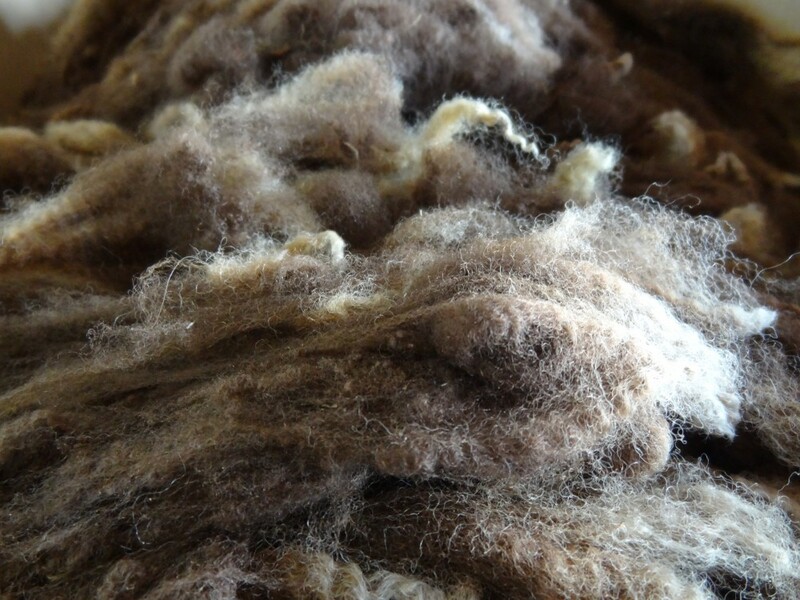 You have members in the scheme who have never before spun or approached raw fleece – that must be thrilling?! It has been a delight to follow the stories of the sponsors themselves, especially those who are experiencing raw fleece for the first time, and those who have never tried spinning before. The community spirit that this scheme has alighted has been wonderful with more experienced spinners offering advice and guidance; one of the sponsors has even offered her services to other spinners for various stages of the fleece preparation, and for the spinning process itself for those knitters who were looking solely for the yarn. To be honest I had only expected experienced spinners to part-take in the scheme, but it is amazing that it has inspired new spinners and knitters to join in. Having such a diverse range of skills and experience levels has been brilliant on the forum allowing people to swap and share hints and tips as well as experiences. It has also allowed people from all over the UK and the world to chat about the sheep they are sponsoring as well as what they are planning on doing with the wool. Are you planning on running the scheme again? Yes! The sponsorship scheme will be fairly similar next year – there will be new sheep available for sponsorship, as well as some familiar faces from this year. As I am as new to this sponsorship idea as the sponsors are I am open to suggestions on how it can be improved and how to make the process more enjoyable or informative. 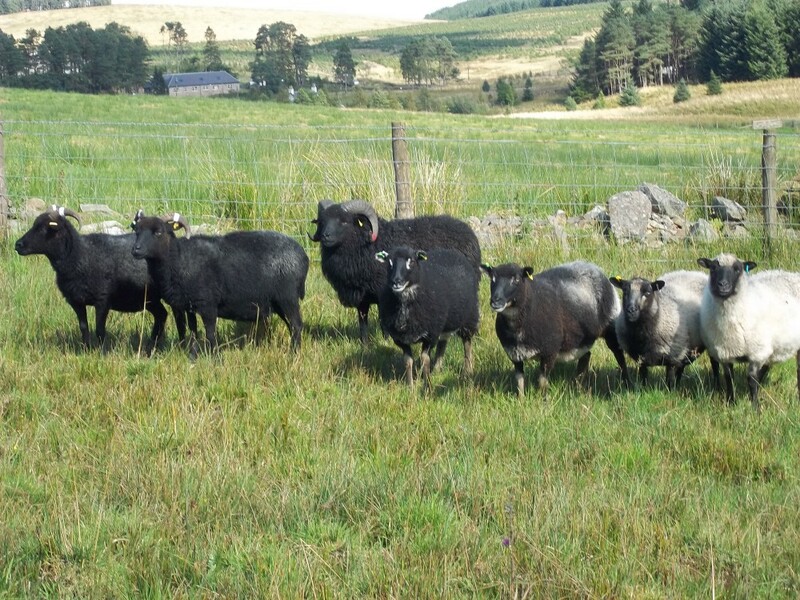 It is anticipated that the next round of sponsorships will begin in February 2015 with a selection of ewe hoggs available and some of the ewes whose sponsorship began in February this year. It has been really fascinating to read about the scheme from Kate’s and tomorrow we will be hearing from some sponsors of the Shankend sheep and their experiences of the scheme.